Eat like a caveman, and you will lose weight and be healthier? At least that’s what one of the most talked about recent diets promises. This article with go in-depth with the Paleo diet so you can learn about what it actually consists of, the research around pros and cons, and tips on how to follow it if you choose to do so. 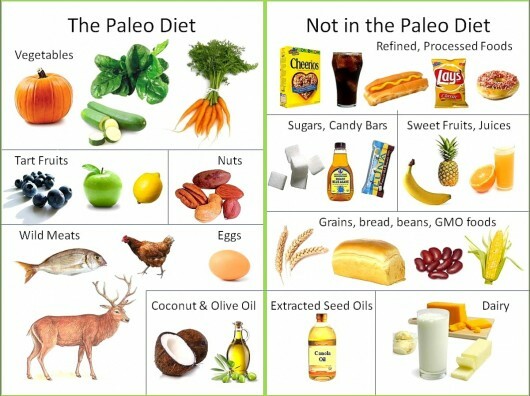 The Paleo Diet, also known as the Paleolithic, Stone Age or Caveman diet, is based on the presumed eating patterns of humans in Paleolithic times. It was invented by Loren Cordain, PhD, who wrote a book called The Paleo Diet; the author claims that by following this diet we will be leaner, and have a lower risk of diabetes, heart disease and cancer. It is based the rationale that the human body has changed very little since the end of the Paleolithic era, thus our bodies were adapted to follow a “hunter and gather” eating pattern, consisting mostly of fruits and vegetables, lean fresh meats, seafood, and nuts, avoiding any and all processed foods. Since our Paleolithic ancestors did not farm, foods that came from developments in farming, like wheat and dairy, also have to be avoided. In interview with Cordain, he says that there is increasing evidence to show that the type of diet recommended by the Food Pyramid is actually not the sort of diet humans evolved to eat. There are a number of “nutritional omissions” in the Food Pyramid, like not distinguishing between different types of fats and much less making recommendations about them. He says that in general, the western diet consumes way to many Omega-6 fats (saturated fats), and not enough Omega-3 fats (monounsaturated and polyunsaturated fats), which leads to heart disease, cancer, and inflammatory responses. The Paleo Diet eliminates breads, cereals, rice and pasta, traditionally put at the base of the food pyramid, and replaced them with complex carbohydrates from fruits and vegetables, and also encouraged the consumption of grass-fed meats and wild fish. What Foods Should I Avoid for the Paleo Diet? What Can I Eat If I Follow the Paleo Diet? It really helps to get into the Caveman mindset to follow this diet. Remember that, according to research, they didn’t farm or process foods, so they hunted, fished and collected other foods available in their environment. The foods can be cooked, though there are some dieters who consume only raw foods believing that our body never adapted to cooked foods. Because it is not always easy to find all of these options in the supermarket or in restaurants, it is recommended that you plan ahead and set aside lots of time for cooking meals from scratch. What Does the Research Say about the Paleo Diet? Is It Healthy? As with all new diets, there is going to be controversy about its effects on the human body and whether it is good for us in the long run. One study from the European Journal of Clinical Nutrition carried out in 2008 carried out a metabolically controlled study in nine non-obese healthy volunteers with minimum activity. There was a control group as well, in order to compare the results in the group of 9 non-obese participants who were on the diet with those who were not. After a few days of diet transition, the individuals followed a strict Paleo diet for 10 days. They saw a reduction in insulin resistance, reductions in total cholesterol, LDL and triglycerides, as well as in blood pressure. All of the participants had the same directional responses to the diet. Another study that looked at the short-term effects of the Paleolithic diet in healthy volunteers, took 20 volunteers to follow the diet for 3 weeks. On average, the group lost 2.3 kg (5 lbs), and reduced 0.5cm of waist circumference. Of course, some of these effects are not surprising when you reduce calorie intake by 36%. There were some positive effects on nutrient intake, like antioxidants and potassium-sodium rate, but there was a reduction in calcium intake. There are some serious and well-respected professionals who are critics of the Paleo diet. One in particular from the National Health Service who called the Caveman Diet a “fad diet.” In the article, it refers this last study mentioned that that was carried out with 20 young and healthy volunteers with a high drop-out rate (70% complete the study), cutting out calorie intake by almost 1000 calories and thus losing about 5 lbs a week. Since it wasn’t compared with another group (control group), it lost scientific validity. Of course, this criticism is more of the methods that the diet was evaluated than of the effectiveness of the diet itself. Another study carried out in 2009 looked at the effects of the Paleo diet on type 2 diabetes and cardiovascular disease. This study took place over 2 consecutive 3-month periods, and it found that the Paleolithic diet improved glycemic control and multiple risk factors related to cardiovascular disease when compared to a cohort group of patients with type 2 diabetes. The article mentions that since the Paleo diet is different from diets diabetes patients are usually put on, it could be beneficial to recommend this diet to patients who are at increased risk of developing cardiovascular disease. The studies of the Paleo diet with relation to heart disease continue. Two studies compared the Paleo diet and the Mediterranean diet with relation to glucose tolerance and satiation (feeling full) in patients with a particular type of heart disease. Both studies showed that the Paleo diet came out on top when compared the Mediterranean-like diet. On the other hand, the evolutionary assumptions of the Paleolithic diet have been disputed, saying that there is no conclusive evidence that our bodies could not have adapted to agrarian-type diets over the past 10,000 years. In addition, other say is unwise to assume that people in Paleolithic times didn’t have micronutrient deficiencies, whereas now, in the western part of the world, micronutrient deficiencies aren’t as much as an issue as chronic illnesses related to excess. In all of this, it is important to point out that all of the studies carried out on the Paleo diet are relatively short-term. Looking at studies that are not about Paleo diets per-se, but about the long-term effects of high protein and low-carb diets (like the Paleo diet), show that there is poor adherence to these diets, although there were reductions in weight and in heart disease risk factors. What Is the Conclusion About the Paleo Diet? Most of the criticisms of the Paleo diet examine the historical validity of the logic and basis for the diet. However, the few studies that have been carried out the evaluate the physical effects of the Paleo diet on the human body, have shown positive effects with regards to weight loss and preventing risk factors. If you think about it, the so-called Paleo diet simply sums up a lot of the recommendations made already: avoid simple carbohydrates and processed high sodium foods; eat a lot of fresh fruits and vegetables, and foods with high Omega-3 fat content. For this reason, it doesn’t seem crazy that there have been positive effects for people following the Paleo diet. However, before you go caveman on us, it is important to realize that the studies show a high drop out rate, despite the positive effects that follow. This is because it is not an easy or cheap diet to follow. Most foods have to be prepared at home, the meat has to be free-range and grass-fed, and eating out is very hard. For this reason, you have to make sure you have a good chunk of time every day to prepare foods that will ensure you aren´t missing any nutrients in your new diet. It is also important to remember that exercise is also highly recommended to combine with the diet. This tells us it’s not just about making slight changes in our eating habits and seeing the pounds shed. If you are looking for a lifestyle change to benefit you for years to come, staying active and eating fresh and healthy is important, regardless of the name of the diet you follow.